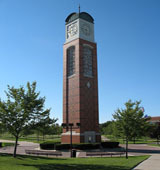 Grand Valley State, a public university located just outside Grand Rapids, MI, offers undergraduate and graduate degrees to about 20,000 traditional and non-traditional students. Students can spend their free time enjoying everything from the Ham Radio Club to the Backpacking Club. Describe the type of student who should not attend Grand Valley State University and explain why. Describe the type of student who should attend Grand Valley State University. Why? What is a typical Grand Valley State University student like? Describe the type of person that should attend Grand Valley State University. What are the top 3 reasons someone should attend Grand Valley State University? I love going to Grand Valley because of the professors and how friendly and informative they are. Also, the student life is great and the location convienence for Grand Rapids residents is great. What was a typical Grand Valley State University student like in high school? Describe the type of person that should attend Grand Valley State University. Why should I go to Grand Valley State University? What were your top five reasons for going there? Grand Valley offers more than 200 areas of study, including 82 undergraduate majors and 29 graduate programs. Teaching in the liberal tradition, whether in general arts and sciences or the professional degree programs, has always been at the heart of Grand Valley's educational mission. What are the top 3 things that students do for fun at Grand Valley State University? the top three things that students do for fun at GVSU is attend sport events, go to the movies, and visiting downtown Grand Rapids. What's your experience with Grand Valley State University housing like? What Grand Valley State University clubs and student organizations do you recommend? What do students do for fun at Grand Valley State University? Campus housing is available for undergraduates. Housing deposit : $150.00. Housing deposit due : Mar 1. Housing deposit is refundable in full if student does not enroll.. Freshman allowed to have car. No pets. 27% of students live on-campus. How did you choose your major at Grand Valley State University? I was originally a journalism major because I love to write, but I ended up switching to something else that was 1) more interesting and 2) the long term effects of switching seemed to be better. 88% of students graduated in the top half of their class. The average student pays $15,664 for tuition, fees, and other expenses, after grants and scholarships. Total stated tuition is $10,716, in-state and on-campus, before financial aid. Learn more about financial aid at http://www.gvsu.edu/financialaid/. Estimate the net price for you at http://www.gvsu.edu/financialaid/netprice. 32% of students graduated on time. 69% of students graduated in six years. The typical (median) early career salary of Grand Valley State University graduates is $39,700, according to Payscale. Grand Valley State University participates in the NCAA Division II for college athletics. Want more info about Grand Valley State University? Get free advice from education experts and Noodle community members. What are the addresses (mailing and email addresses) for GVSU's Pew Campus in Grand Rapids, Holland Campus and Muskegon campus? Does Grand Valley State University offer a summer dance camp?